Outdoor entertaining areas are looking more and more like the inside of your home; some really look like they belong inside. With the new choices in building products, outdoor fabrics, furniture, outdoor rug options and lighting, you can truly get a luxurious vibe and elongate the time spent in your backyard! We have included ‘Four Sizzlin’ Summer Home Decorating Trends’ to inspire you to add a little or a lot of change to your own backyard. We have tricks and tips to give your home a fresh look for the upcoming summer season. Think ‘stay-cation’ and bright, light and cozy! Full service kitchen and bar! Outdoor entertaining definitely includes a space to mix drinks or cook a meal. And we are seeing similar styles to what we would put in an indoor kitchen and bar. If you are investing in a full service kitchen make sure you have plenty of seating so people stick around longer. Lighter furniture in style and finish with natural linen looking upholstery is not only hot for inside the home but for outside as well. Mix and match your dining area. We were are Home Depot recently and were eyeing these natural wicker chairs and table! For a more budget friendly outdoor entertaining area, create a cozy spot with a fire pit! It’s a natural gathering spot to pull people in and extends the amount of time you can be outside. Create a great destination right outside your window, or choose a spot perhaps farther from your house and add stepping stones to get to it. No need to have all your entertaining spots be on the same slab of concrete or brick; combine stone with gravel, or wood with rock. Create an outdoor living room! 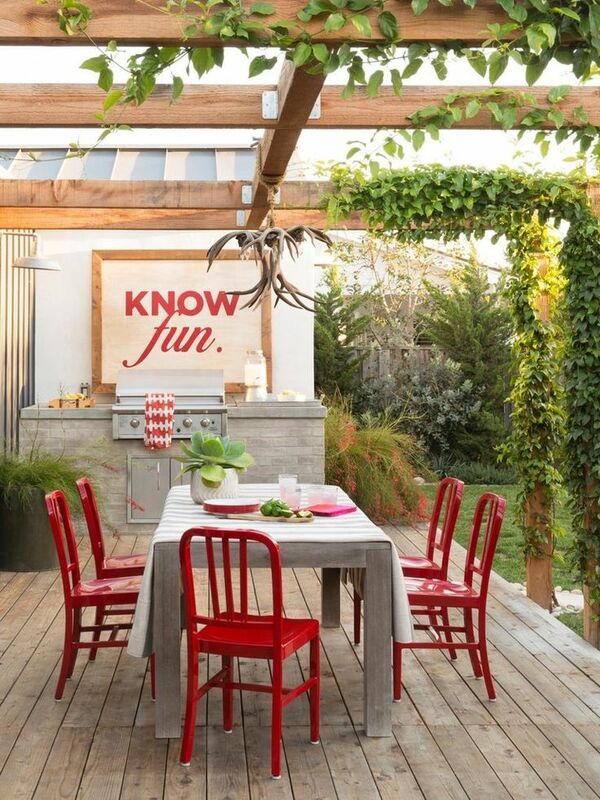 We have been eyeing up this California theme of brining your indoor style and comfort outdoors seamlessly! We start with your fabric and rug choices that don’t have to look ‘outdoor-ish’. We use resilient fabrics such as Sunbrella and Duralee for upholstery; they have fabrics that look like they belong in your living room! In case you did not know, these specific fabrics are water resistant, stain resistant, anti-fungal and anti-microbial. The colors for upholstery we are seeing are more sophisticated and understated. The accent colors for this summer is definitely indigo blues. We still love a good stripe fabric because it is almost fool proof to incorporate anywhere! And lets talk about outdoor rugs because, wow, there are so many options! I like to go large to cover a lot of my seating area to make it feel like a bigger space. Sometimes I start with the area rug to inspire me. Indigo blues are the big trend this summer. Try Pottery Barn’s Jensen Diamond Blue Outdoor Rug to bring in a rich blue hue. Planters and grass. Again, we are seeing the use of more natural elements like stones, rocks and plants to define and separate outdoor entertaining areas. Here are some ideas: Create a border with planters for a private oasis, whether you are keeping your plants low or growing a tall hedge. Also use gravel, pavers or a change in brick style; or an idea like this, a thin line of grass or border plant, to create separate areas in your outdoor space, like you would an interior wall!